and brighten your private room. Lounging in the shade of a mango tree. Bay, a private Estate along the Island's North Coast. comfort, practicality and ‘easy living’. To ensure your maximum enjoyment during your Jamaica vacation. The villa bedrooms are therefore airy and light with plantation-style windows to take full advantage of tropical breezes. Ceiling fans within each bedroom reduce the need to use the air conditioning that is also found in each bedroom. opening out on to the rear terrace. Seating in this area makes it the perfect spot for a quiet read. Located on the ground floor, Bedroom One has a four poster bed . Bedroom One looks out on to the rear gardens and is conveniently located to access the rear terrace. A cool tiled floor is laid throughout. The en suite bathroom has a tub with overhead shower. Located on the ground floor, Bedroom Two has a solid Mahogany King Poster Bed. Bedroom Two looks out to the side of the property. Privacy is ensured in all bedrooms with the planting of palms and tropical foliage around the villa. Located on the first floor, the Master has a solid mahogany King Poster bed. The Master is a large bedroom which also has a wooden louvre window that overlook the rear garden. Wooden parquet and ceramic tile flooring is laid throughout the suite. leading out to the veranda lobby area, rear terrace and dining room. The soft furnishings are again cottons in neutral and natural colours. You will also find natural fabrics, mahogany, bamboo, teak and rattan and seagrass furniture within this room. amenities to be enjoyed within the Living room are listed on our Villa Holiday Amenities Page. fruits found in Jamaica. Vacation Rental rates include the preparation of your meals. A fun filled '8' shaped pool with fun slide for added enjoyment. Pool depth ranges from 4' 3" - 6' 6". We have an excellent range of pool toys and equipment - further detail on our Villa Holiday Amenities Page. A quiet and shaded spot for tranquil moments. Overlooking the rear garden, hanging chair hammock and teak relaxing bench. Our staff cottage is also at the back of the garden. 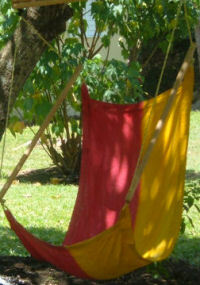 The gardens provide special spots for enjoyment activity or relaxing. A large and flat front lawn is ideal for games and active play. You will also find a rope hammock and ladder here.